A few days ago, I bought a couple of "color tattoos" from maybelline. They are pretty new (I think they only came out a few months ago), and I have to say, I love them. The two I bought are Bad to the Bronce and Taugh as Taupe. The first one is a broncy/coper color (depending on how much product you use) and very glittery, I love it, but it's not the best product to use during the day. So that's why I decided to buy Tough as Taupe, a grey taupy color, completly matte. Both of them aply very smoothly on the eye and, once they dry, they don't crease nor budge. They are also perfect as eyeshadow base. I've used Bad to the broce across the lid with a dark brown on the outer corner and it lasts for hours. 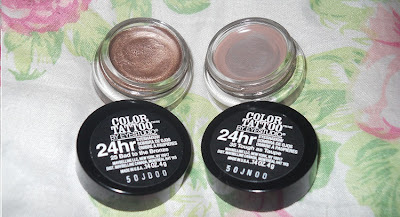 Hace unos días, compré un par de "color tattoos" de maybelline. Son bastante nuevas (creo que sólo salieron hace un par de meses) y tengo que decir que me encantan. Los dos colores que compre son Bad to the bronce y Tough as taupe. La primera es un color broce/cobre (dependiendo de cuanto producto se use) y tiene mucho brillo, si bien me encantó, no es lo más "usable" durante el día, por lo que decidí comprar también tough as taupe, un color que es un gris topo un poco amarronado, completamente mate. 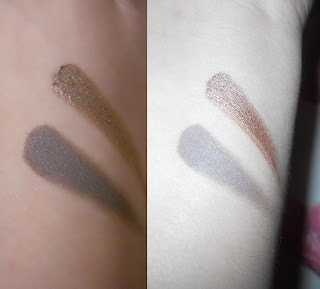 También son perfectos como base para sombras, he usado Bad to the bronce en todo el párpado con un poco de marron oscuro en la esquina exterior del ojo y me ha durado por horas. i really like the tough as taupe one! i already have bad to the bronze and i love it! sure thing, I already follow you on bloglovin. Nice post hunny i love shades like bad to the bronze. I love these, i have the taupe colour and its so creamy and easy to apply! I wanted to get them for so long ! I think I just need to jump and try, cause it looks so pretty ! I love your blog! It so lovely! OMG this sounds impossible! How can they not crease? That bronze colour is incredible! I think it's because they dry really quickly, like a shadow base, But I have oily skin and I swear they don't crease. i don't know about 24, but I've worn them to work and then college and they stayed on at leats a good 10-12hs. Want them!Pls post more! Shall we follow each other? i love comment and browse blogs i followed!